There are a lot of treadmills on the market but one of the best mid priced ones is the Sole F63. 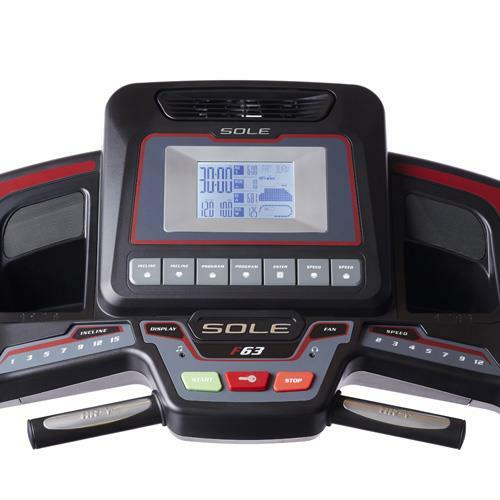 It is Sole’s best selling model and one of the best selling treadmills in it’s price range. Because of its popularity I thought I would give you my take – My own Sole F63 treadmill review. There are some things I love about it but some things I don’t. I love being able to work out at home. Getting your daily exercise in the privacy of your own home is better than going to the gym in so many ways. I can listen to my own music or watch my own shows on tv, I can easily keep an eye on my kids, and I don’t need to spend the extra time and effort into making the gym work with my day. I used to live pretty close to the gym I went to and even then I sometimes found that I had the energy to work out but I didn’t have the time to spend away from home. You may think that maybe it’s cheaper to go to the gym than to buy home exercise equipment but it actually isn’t. A quality mid priced treadmill will last more than 5 years but will pay for itself in only one year. And if your whole family uses it then it’s even better! Not to mention that you will use your equipment more when it’s at your home just begging you to be used. Of course the first piece of fitness equipment anyone should get is a treadmill. Treadmills are really useful for more than just walking and running. You can do lunges or side steps, and if your treadmill is able to incline then you can work all kinds of different muscles. Not to mention that running on a treadmill works the most important muscle in your body, your heart. 1 How is the build quality? 2 Is it too loud? 3 What is it like to run on? 4 What Features does the Sole F63 have? 5 How Is The Sole F63 Delivered? 11 Who Is The Sole F63 For? You wouldn’t know it by its build quality but the Sole F63 is actually Sole’s cheapest treadmill at $1000. This is really a testament to the quality of Sole’s equipment. All of their treadmills are high quality. The Sole F63’s build quality is just as good as much more expensive treadmills. Build quality is the most important thing on a treadmill and that’s why I always recommend buying a mid priced treadmill like the F63 at least and not those cheap ones that won’t last a year. I have had experiences with cheaply made home exercise equipment that falls apart as you are using it. We used to have a budget treadmill (I won’t mention the name) where the belt literally split into two as I was running on it! It was enough for me to say “never again”, and now my family and I only use quality equipment. The steel frame on the Sole F63 is really thick and heavy and comes with a lifetime warranty. The F63 is solid as a rock and won’t rattle or vibrate as you run on it. Having a rattling piece of exercise equipment drains me faster than a full sprint. The Sole F63 also has a cushioned deck that helps it stay quiet when you run. Sole calls it the Cushion Flex Whisper Deck and basically it means that the deck has a little bit of give with each step you take. I like to listen to audiobooks while I run in order to stay productive and I can easily listen while running. Not only does the cushioning make the deck quieter but it is actually easier on your feet and joints. I stopped running on concrete a while ago because of bad knees and I only used ellipticals for a while so the Sole F63 is great for me. What is it like to run on? Overall the Sole F63 runs great. It has a pretty powerful 3 CHP motor that helps it keep its speed. As I said before it is low impact which is great for my knees and feet. There are some problems though. One problem is that the console and the arms seem kind of low. It doesn’t really cause any problems for me unless I’m on a steep incline but I can imagine that taller people would have problems with needing to lean over unnaturally in order to reach the controls. Another problem is that it is slow to change speeds. For some reason the Sole F63 seems like it takes a while to get up to speed or to change from 4 mph to 6 mph and so on. This is basically no more than a minor annoyance for me since I tend to run at a constant speed but if you wanted to do interval training it may be a problem. What Features does the Sole F63 have? The tread on the Sole F63 is a very large 20 inches by 60 inches. This is one of the biggest running spaces on a treadmill in this price range. Most treadmills at this price will have a tread length of 55 inches which starts to feel really crowded as you start to speed up. Sole says that the tread belt is 2 ply. I have never had to replace a tread belt before but you can definitely feel the difference in quality between a 1 and 2 ply belt. It should last you a long time. I already talked about the cushion system earlier so I won’t go into detail again. I’ll just say that Sole’s Cushion Flex Whisper Deck system really works and makes running quiet and easier. Many people need to know how high the deck is off the floor because they are either really tall or have low ceilings. The Sole F63 has a pretty low deck compared to many treadmills at 7.5 inches. Some ProForms and NordicTracks can have decks that are almost a foot off the ground. The Sole F63 is a folding treadmill which is very convenient for anyone who doesn’t have a dedicated home gym room. Lifting the deck into the folded position is super easy because of the piston that helps with the weight. Also when it is folded up the F63 can be tilted and wheeled out of the way. Don’t plan on wheeling into a different room though because it is wider than most doorways. When you are ready to lower it down you just press against the the deck and pull the big yellow lever and let it fall. The piston does all of the lowering work for you so you don’t need lower it yourself. It will just gently and lightly fall to the floor. The Sole F63 can go from .5 mph to 12 mph. This is a pretty standard range although some cheaper models only go up to 10. One of the problems I have found is that there isn’t a button for every speed on the console. The mph buttons go 2, 3, 4, 5, 7, 9, 12. It’s funny because my two favorite speeds are 6 mph and 8 mph, two speeds that don’t have their own buttons. So if you want to run 6 mph you will have to press the 5 button and then the up button 10 times. This is really inconvenient, especially when you are running fast. The incline can go from flat to a 15% grade and the button layout is the same way as it is with the speed. The buttons on the console go 1, 3, 5, 7, 9, 12, 15. If you wanted to run at a 4% grade be prepared to push a lot of buttons. Of course the problem with the buttons mostly affects people who like to run on manual, like me. On the plus side there are speed and incline, and up and down buttons on the arms of the F63. This helps make the button problem not so bad because it is much easier to adjust your speed and incline by using the buttons on the arms rather than on the console. One neat thing you get with the Sole F63 is a chest strap heart rate monitor. Usually these are included only on more expensive models. A chest strap is more accurate than a Fitbit or or pulse grips. Plus you can’t exactly use the pulse grips when you’re running, but you can easily run with a chest strap. The chest strap connects with the treadmill and you can then adjust your speed and incline based on your heart rate. The Sole F63 had ten built in workout programs. There are 6 standard programs, 2 programs that you can customize, and 2 heart programs. The heart programs are cardio and fat burn. The cardio programs use the heart rate monitor and will adjust the speed and incline of the treadmill based on your heart rate. It depends on your age and weight what your target heart rate will be on the heart programs. But the cardio workout keeps your heart rate really high and the fat burn program keeps your heart rate only kind of high. The console on the F63 has two speakers that are plenty loud. There is an auxiliary port (which is the same as a headphone jack) in the middle of the console where you can plug in your phone or mp3 player to listen to music through the speakers. This is a must have feature for parents. Before kids I could run with headphones in but now I need to keep my ears open! I do wish that the Sole F63 could play music through bluetooth. I don’t like to have the cable cluttering up my console. The treadmill does actually have bluetooth but it can’t be used for playing music. Not only can the Sole F63 connect to your chest strap heart rate monitor with bluetooth but it can also connect to smart fitness gear. You can send all of your workout information to your fitbit or Apple health or a bunch of other devices and programs. You can also use the bluetooth see all of your fitness data live on your smartphone or tablet. It kind of mirrors the screen of the F63 on your phone. But like I said before, you can’t play music through the bluetooth which is a feature I really wish it had. There is a lot of space and a lot of compartments on the F63. You could fit a bunch of oversized water bottles, some smartphones, and a couple of books if you needed to. I like to keep my console clear of clutter though and I don’t let the kids put their toys in any of the compartments. One “must have” for me is a fan and fortunately the Sole F63 has one. There are two fans at the top of the console in the center that can blow cool air right in your face. The screen on the F63 isn’t super impressive. It’s a 6.5 inch, blue and white LCD screen. Many other companies are putting large attractive touchscreens on their treadmills. Of course I have said before that I’m not sure that a touchscreen on a treadmill is a lot better than just having physical buttons. The screen displays heart rate, speed, pace, incline, calories burned and other information as well. How Is The Sole F63 Delivered? No treadmill is easy to have delivered and moved around. It’s the nature of the beast when you buy a 250 pound item. The Sole F63 comes in a giant box that is 3 feet wide, 7 foot 2 inches long, and 17 inches thick. All together with the box it weighs between 250 and 300 pounds. Unless you are competing in the World’s Strongest Man competition you should not even attempt to move this thing by yourself! You need two strong men at least. I recommend having the shippers move it into your house and take it to the room where you want to keep it. From there assembling it yourself is easy. However, if having a helping hand isn’t a problem for you, just head over to Amazon and get there with free shipping and easy customer service (they always side with the customer if you ever have any problems). If you order from Sole’s website you have 3 shipping options, standard residential, ground inside, and turnkey. Standard residential is a free option where all they do is get it to your house. If I read correctly it seems like you are even responsible for getting it off of the truck! No Thank you! The next option is my favorite, ground inside. If you choose this option the delivery men will carry the treadmill inside your house to any room you like, even up or down stairs. Make sure you have them carry it to the room that you want to keep it in because once it is there you might not be able to move it out. You have to assemble the F63 yourself with this option but assembly is easy and takes less than an hour. This option costs $99. Turnkey is the final option. This is where the shippers will move it into your house and then assemble the treadmill themselves. This option costs $239. You will want this option if you have no interest in trying to assemble the F63 yourself. If you read some other Sole F63 treadmill reviews you will find some people complaining that they can’t use their F63 because it came with a low speed error called LS1. I have not had this problem but I have read about it. You can actually sometimes fix this error yourself and there is no need to call customer support or pull your hair out. Turn your treadmill off and then back on. Remove the safety key (that red thing that stops the treadmill if it’s removed). Hold down the start and speed up buttons on the console while you put the safety key back in place. After you do these steps the screen will light up and then some words will scroll across the bottom. Press enter and it will take you through some steps to calibrate your treadmill, like asking you the roller size (2.5), the lowest speed (.5), the top speed (12), and the incline (15). Once you are done pressing all the buttons it will start testing all of it’s features, you do not want to be standing on it when it does this. The track will speed up all the way to 12 mph and the incline will go all the way up. The Sole F65 is just a few steps up from the F63 but it is mostly the same. The F65 has a more powerful motor at 3.25 CHP and also a track that is 2 inches wider than the F63. The wider track is really what makes the two treadmills different. The screen is also a bit bigger on the F65 at 7.5 inches instead of 6.5. But really the screen isn’t any different other than that one extra inch. The Sole F65 is a few hundred dollars more at $1299. I suppose if you have a wide gate or are just a bigger person generally than maybe the extra $300 dollars would be worth it. The F80 is really a few steps above the F63. The F80 has a much more powerful 3.5 CHP motor, a wider 9 inch screen, and a wider 22 inch tread. It also has a higher weight capacity at 375 pounds where the F63 has a capacity of 325 pounds. Really these are mostly small upgrades but they could mean a lot to some people. The F80 is $1499 and the F63 is $999. See also the Sole F85 treadmill review – the rated big brother of the Sole F63. The ProForm 995 is similar to the Sole F63 in a lot of ways. Both treadmills have the same running space and their motors have the same amount of power. The big difference is that the ProForm 995 is compatible with iFit. iFit is a big draw but you do have to buy the subscription and the ProForm 995 is also $500 more than the F63. Without iFit, dollar for dollar the Sole F63 is a much better treadmill. Who Is The Sole F63 For? The Sole F63 is a great mid priced treadmill that almost everyone will be happy with. People who want to invest in the health of themselves and their families will find that the F63 will serve them well for many years. People who exceed the 325 pound weight limit will want to to upgrade to a larger model. Like I said before, the most important thing about a treadmill is the build quality, and the Sole F63 has it. The F63 is a very sturdy and reliable treadmill. With a lifetime warranty on the motor and the frame and a 3 year warranty on just about everything else you don’t have much to worry about. The F63 has great features like the heart rate workout programs and the speed and incline buttons on the arms. It has pretty much all the basics that anyone will truly need in a treadmill. If you’re willing to pay for someone to ship the treadmill to your house and install it for you as well, the turnkey service with Sole Fitness might be for you. However, if you want simple shipping with easy customer service I would personally go with Amazon where the returns and customer service is nice and easy if you ever need it. Thanks for reading the review, I hope it’s been helpful! Just unpacked and assembled my F63 but am yet to use it. It certainly looks and feels pretty solid! Reviews like this have been extremely helpful in terms of helping me decide which model of treadmill to purchase. Also, glad you mentioned that the speed buttons are in mph. As I am used to running at 12-14kmh (I don’t live in the US), I would have been in for a shock had a I jumped on and cranked it to 12! Just wanted to say this was a really great review. It’s nice to get the perspective of a genuine user with relatively detailed pros and cons. Keep up the good work.